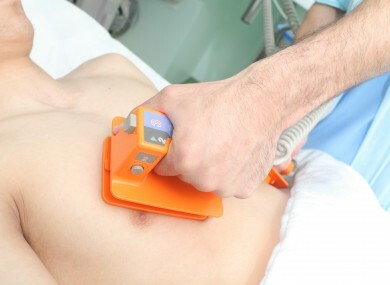 The defibrillators would be used in the event of an out-of-hospial cardiac arrest. THE FEASIBILITY OF defibrillators in public places is to be examined by the Health and Information Quality Authority (HIQA). After a request from the Minister for Health, James Reilly, HIQA announced today that it is going to undertake a health technology assessment (HTA) on the provision of public access defibrillators in Ireland, for use in the event of an out-of-hospital cardiac arrest. They will look at the clinical and cost-effectiveness of different strategies to make automatic external defibrillators (AEDs) more widely available throughout the country. It said that the results will inform decision-making on issues related to the Public Health (Availability of Defibrillators) Bill 2013. The bill was introduced in Seanad Éireann earlier this year. will examine various strategies around public access defibrillation in Ireland and evaluate how these potentially life-saving devices can be used in the event of a person having a cardiac arrest in a public place. Dr Ryan said that published data indicate that between 2003 and 2008, the survival rate for out-of-hospital cardiac arrests ranged from 3 per cent to 11 per cent. An expert advisory group will provide advice, support relevant parts of the evaluation and critically review the draft report. HIQA will bring the completed evaluation to the Minister for Health. Email “Study to look at feasability of defibrillators in public places ”. Feedback on “Study to look at feasability of defibrillators in public places ”.